External inline pcp regulator with integrated fillset. 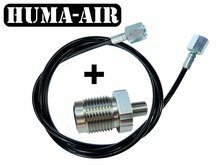 This External PCP Regulator build by Huma is specialy designed for airgun shooting is can be screwed on to a 200/300 bar scuba tank with DIN connection. The regulator will reduce the outgoing pressure according to your settings so you can optimize the working pressure matching your airrifle. This will result in a constant pelletspeed and better groups. 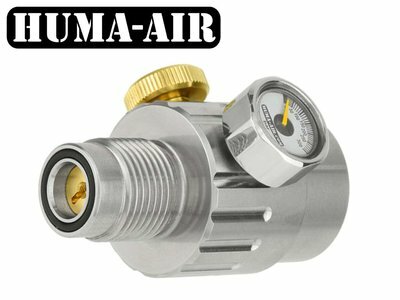 The regulator is equipped with a pressure gauge what will indicate the set pressure. 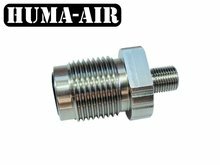 The ressure can be set by turning the set-screw to adjust the pressure. Just unscrew the regulator from the tank, adjust it it to your wishes, and screw it back on. Within these settings the regulator can be set stepless in pressure. The standard setting is “2” in the pressure range 100-200 bar. If you already have a fillset with 300 bar din connection it can be screwed into the regulator. The regulator is sent well protected and inshured in a cardbox box worldwide. 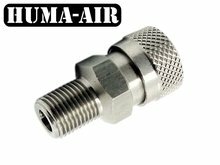 We have also a model available what is completely adjustable in pressure from the outside. Very good job with a reguled and no reguled gun, very accurate with my bulldog357 (spread 7/8fps) 220 bars regulate for 965 fps with 80 grains jsb!!! excellent product!!!! i am a benchrest shooter and it works very good!! reliable!! de MKII werkt lekker, nu nog een variabele waarbij je met een knop de druk kan regelen, en ik koop er nog een. Great product and service! 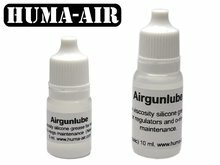 I use it inbetween my SCBA tank and my airgun so I don't have t refill inbetween the shooting, works perfect for this! Good service..helpfull fast delivery good regulator. Thanks!!! at the moment I am not able to make a judgment on your external controller because I still have not used. However, I can compliment the speed of delivery and with your after-sales service to the information received to my questions. I purchased the second one because of how well the first one performed for me . This item is very well made and and easy to adjust and performs great . 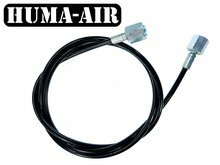 Thank You , Huma-Air . Good, well made, compact product. Works well.